Some days you want breakfast food. Other days you want a steak or a burger. In this cruel world that makes you choose between the two, the Hamilton Beach is here to save the day. Electric griddles are already on the rise. The simplicity of an electric has made cooking breakfast food easier than ever before. It makes sense, as bacon, eggs, and pancakes are the three greatest foods ever made. But the griddle has become too singular purpose. You only bring it out when you are cooking some serious breakfast food. It usually ends up sitting in storage and you don’t end up using it as much as you had originally planned. When purchasing a griddle there are a few things you need to look out for. You need to make sure that it’s easy to clean, otherwise you’ll spend more time cleaning that you did cooking and eating. No one wants that. You want to make sure that nothing will warp. If it’s an extremely long griddle with no support in the middle, the griddle will bend, your grease will collect and run, and your griddle will die far too young. 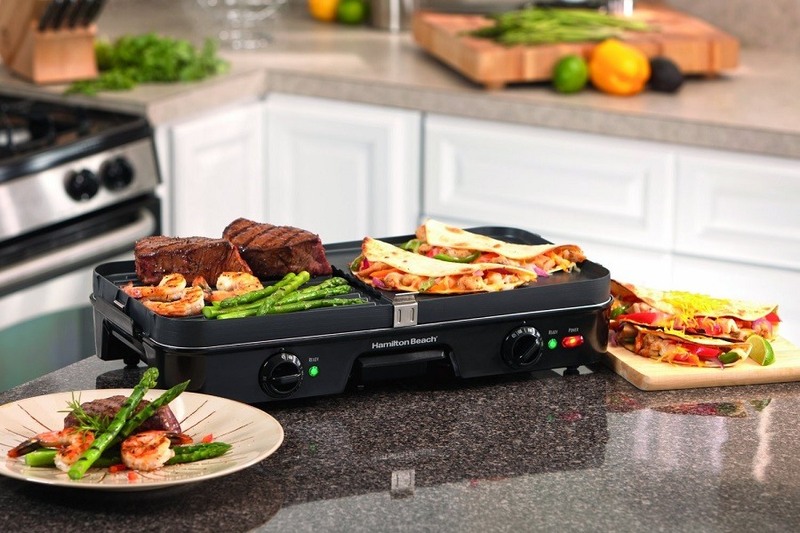 The Hamilton Beach 38546 3-in-1 Grill/Griddle is a great griddle that we will be talking about today. 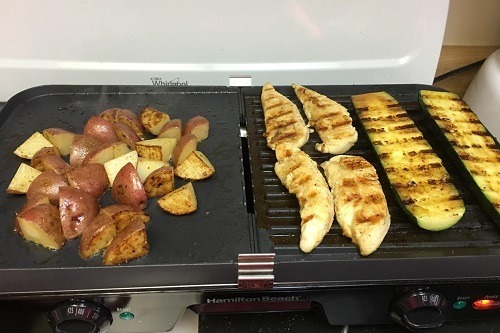 Double-Sided Plates - There are two separate grilling surfaces. Both are removable and dishwasher friendly. Each plate comes with a smooth side for griddling and a ridged side for grilling. You can even use one of each at a time and cook yourself a burger with pancakes. It’s the American dream come true. Grease Channel & Tray - The pans collect grease in center, and a river of bacon grease flows into the center channel which collects in the grease tray. The tray is easily removed and dishwasher friendly. If used correctly, this makes cleanup extremely easy. ​Dual Adjustable Heat - You have the ability to control each plate separately. You can cook one side on low heat, while the other is on high heat. This gives you even more control and versatility with your griddle/grill. PFOA Free Nonstick - Anyone who still has the hazardous PFOA in their nonstick surfaces is a criminal. 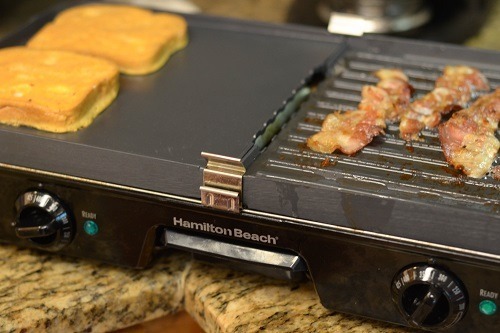 The Hamilton Beach comes with a nonstick surface that you can even cook eggs on without adding grease. There is no PFOA on the 3-in-1 so you can rest assured. The griddle has evolved from just being a simple electric griddle. It offers you a grill and complete control. The griddle has mostly good reviews with a few extremely negative reviews. It has a 4 star rating on Amazon at the time of this review. The reviews for this griddle are as different as the North and South Pole. In my research I did find one thing that everyone agreed on. Everyone seemed to love the grill at first. The big negative complaint are that the grill essentially stops functioning well after a few months. Even the lowest 1 star review will admit that the grill worked great at first. After a further investigation, I think I found the key to understanding the discrepancy. I only used the product for about a month before I wrote this review, so I was unaware of any long term damage myself. What seems to be the problem though, is a lack of proper maintenance. You need to clean the Hamilton Beach regularly. What’s most important to watch out for is the grease channel and grease tray. When this fills up beyond capacity and overflows, the grease seeps into the electronic control unit and this can disrupt one if not both burners. This is definitely a manufacturing issue. I would knock off half of a star for this defect, but as a food professional, I would never let the grease get so filled up. One of the first things you learn in culinary schools is to be weary of grease. Awareness of this issue will allow you to completely avoid this issue and reap only the benefits of the machine. The only other thing I would caution you to be aware of is the sheer size of the griddle and grill. It’s quite big, so make sure you have the storage space for it. Asides from this, I am very happy with the dual control and dual plates. It cooks a mean steak, and I can prepare myself my favorite morning meal: steak and eggs. The grill is great with chicken as well, and the griddle makes the best pancakes. The cord is a little short, so you may need an extension cord, but besides that the grill is a great bargain. 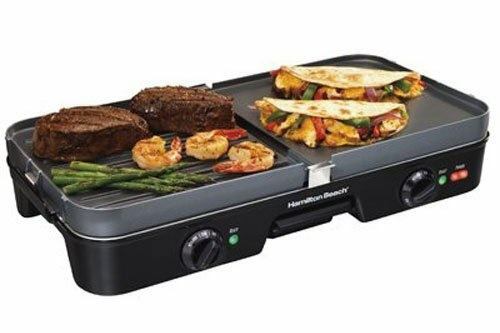 Like with most kitchen electronics, the best place is to purchase The Hamilton Beach Grill And Griddle is Amazon. It will run you around 40 dollars, which is a great bargain considering you get a grill and a griddle. You can find it in retail stores like target and JCPenney, though there’s a good chance you will find yourself paying a little extra. While you’re at it on Amazon, buy yourself some pancake rings so you can make the perfect pancakes. The Hamilton Beach 38546 is a great bargain at only around 40 dollars. 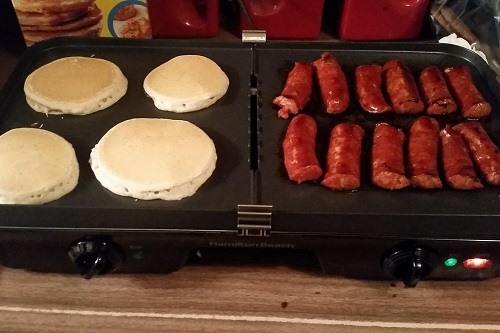 Most griddle and grill combos will cost you well above 60 dollars. The griddle is great quality, but most important it is very easy to clean. They made it very easy to clean for a reason. If you don’t properly clean the grill, and if you don’t regularly clean the grill you will find the grease overflowing and damaging the product. Though it is large, it is very lightweight. As long as you have the room to store it somewhere, this isn’t much else of an issue. So what are you waiting for? Head to Amazon and get yourself a griddle/grill today.